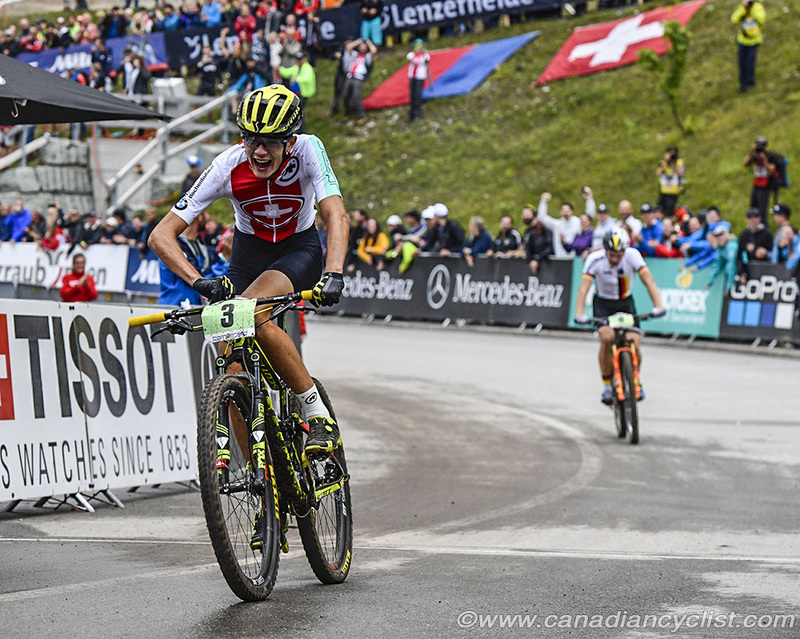 Canada had top-10 finishes in both the Junior women's and men's cross-country races on Thursday at the Mountain Bike World Championships in Lenzerheide, Switzerland. 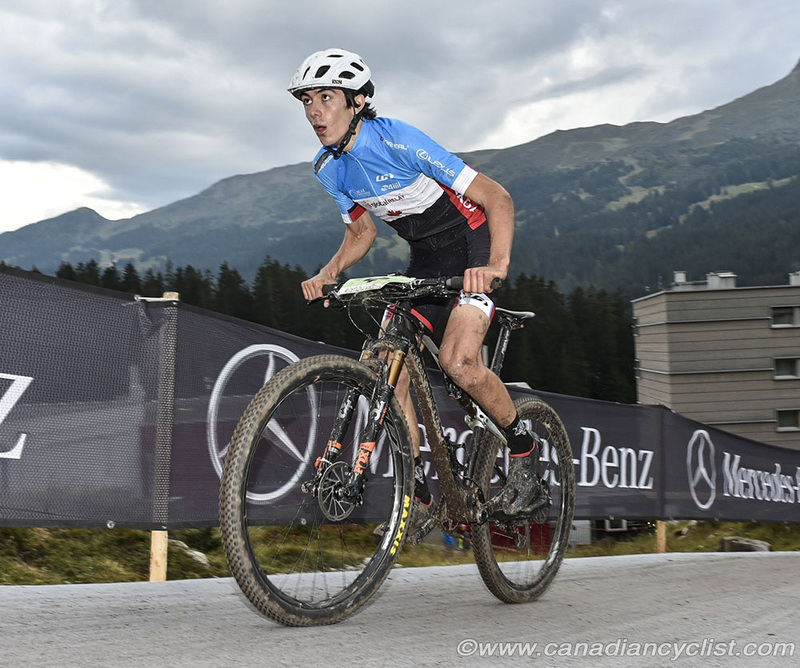 For Canada, Marianne Theberge took eighth in the Junior women's race, while Holden Jones was ninth in the men's. Austria and host nation Switzerland were the winners. 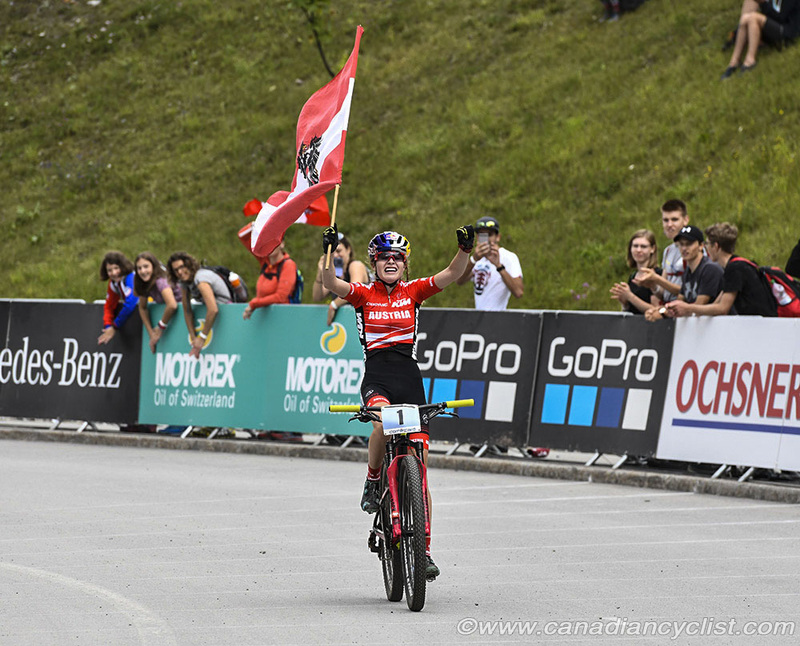 Laura Stigger of Austria repeated as the women's champion, while Alexandre Balmer brought Switzerland their second gold medal, after the Swiss won the Team Relay on Wednesday with Balmer on that team also. Stigger was untouchable in the Junior women's five lap race, riding away from the rest of the field on the opening climb, and extending her lead throughout the race to win by over three minutes. Tereza Saskova of the Czech Republic moved into second on the first lap, but was challenged in the second half of the race by Harriet Harnden of Great Britain. Saskova managed to drop her British rival in the last half lap to take the silver medal, 34 seconds in front of Harnden. Theberge moved up on the first lap into the top 12, and then slowly began to reel in other riders. 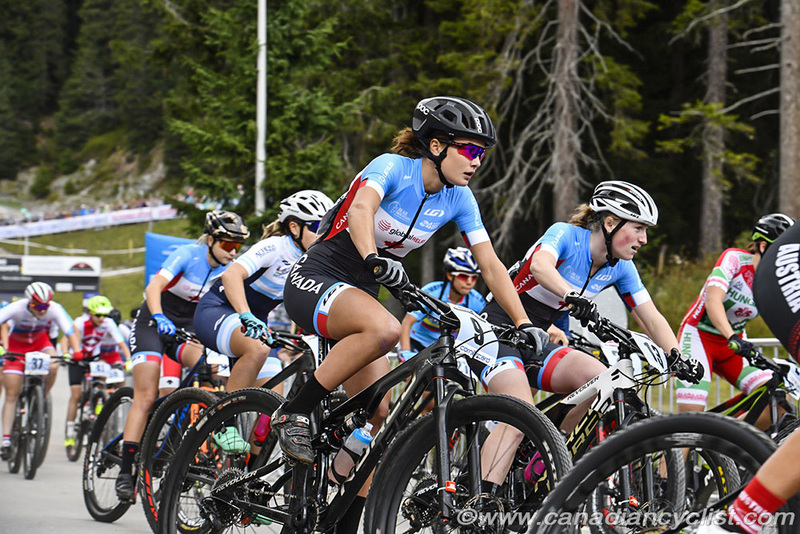 "On the start climb I was in the 20s," explained Theberge, who is at her first world championships, "and on the descent I was able to catch some girls, and after that it was just full gas all race. For a while I was up to seventh, but then I had problems on the roots, and she [Schneebeli of Switzerland] passed, and I didn't have time to catch her before the finish. I didn't know what to expect, so I'm really happy." Other Canadian results were Roxane Vermette in 22nd, Mireille Larose Gingras in 28th, and Eva Poidevin in 43rd. The Junior men began in rain, making the track slick and treacherous, although it gradually dried out in the second half of the six lap race. Mathis Azzaro of France jumped out to a strong lead in the first half of the race, opening a maximum gap of 41 seconds on the second lap. His gap began to shrunk after that, with Leon Kaiser of Germany, Balmer and his team mate Loris Rouiller steadily closing in. By the start of the last lap, Balmer, Kaiser and Azzaro were together, and when Kaiser attacked, only Balmer could respond. The Swiss rider then countered to cross the finish line a slim two seconds ahead of Kaiser, and immediately collapsed after his effort. Azzaro held on for third ahead of Rouiller. "My start was very bad," said Balmer, "and I lost 30 seconds. In my head, I thought my race was over, but I decided to get everything - for my country, my family, my team. I just kept calm, but it was very long and difficult. Leon [Kaiser] went crazy on the uphill, but I was able to come back; it was a crazy race. I am usually not so good at altitude, so I'm very happy with this race; it has been a perfect season. Now I will focus on Innsbruck [Road World Championships]." Jones, who won the bronze medal last year, had a strong start, and was in the top five after the first lap. Mid-race he faded a bit, losing a few spots before the finish. "I was watching the forecast all week and it showed that it was going to start raining just before our race," said Jones. "So, I was messing around with tires, and I think I chose the right ones. I ride in the rain quite a bit in Squamish, so I'm pretty used to it. The start was pretty hard, going right uphill on a paved climb and I didn't want to burn all my matches, so I held back a little bit. I moved up a few spots on the first couple of laps and then I faded a bit, but it was a pretty perfect race." Other Canadian results were Carter Woods in 12th, Charles Antoine St-Onge in 25th, Tyler Clark in 56th, and Colton Woods in 61st.